The OR-167/G is a life-sized TPE love doll by OR Doll (Oriental Rose). The female doll has a body height of about 167 cm (with head) respectively 150 cm (without head) and weights 42.5 kg (without head) respectively 44.5 kg (with head). The OR-156/B is a life-sized TPE love doll manufactured by OR Doll; the female love doll has a body height of 156 cm and weights 26 kg. With her body measurements of 71,5 cm (breast), 54,5 cm (waist), 80 cm (hips), this doll looks as well slim as feminine. The first head accompanying the OR156-B body was Sara with eurasian facial features; Sara is supposed to have a French father and a Chinese mother. The Sara head sculpt was followed by Rose, an European face with nordic facial features. The looks of both heads can be customized with different eye colors, skin tones, hair colors and hair lengths. OR-156/F is a medium-sized TPE love doll by Oriental Rose (OR Doll). The female doll is 156 cm tall and weights 27,5 Kilogramm (without head). With a breast circumference of 85 cm (waist: 56 cm / hips: 82 cm), OR156-F shows amazing female curves, without looking out of proportion. OR156-F has a metal skeleton with joints; the body is as well flexible as photogenic. The range of possible movements is demonstrated in this video about OR Doll OR156. The OR-156/G is a medium-sized TPE love doll by Oriental Rose (OR Doll). The female doll is 156 cm tall and weights about 30 kg (without head). With a breast circumference of 93 cm (waist: 59 cm / hips: 92 cm), the OR-156/G shows lucious female curves. OR-156/H aka Molly is a medium-sized TPE love doll by Oriental Rose (OR Doll). The female doll is about 156 cm tall (5.15 ft) and weights ca. 31 kg (without head). With a breast circumference of 98 cm (38.58" / waist: 59,5 cm / 23.42"/ hips: 86 cm / 33.86"), the OR-156/H shows lucious female curves. OR-023 is a female head by OR Doll. The head is made of TPE. Head No. 94 is a female OEM head by OR Doll. The head is made of TPE. Alisa (OR-003 & OR-004 / Jinshan no. 19) is the third female head for OR Doll's TPE love doll OR156 (156 cm). The head is made of TPE. The looks of this head can be customized with different eye color, skin tones, hair colors, and hair lengths. Rose (OR-005 / Jinshan no. 26) is the second female heady for OR Doll's TPE love doll OR156 (156 cm). Rose, also known as Marian, has caucasian facial features and nordic looks. Rose's appearance can be customized with different eye colors, skin tones, hair colors, and hair lengths. 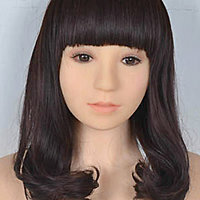 Sara is a female head for OR Doll's TPE love doll OR156 (156 cm). Sara fas eurasian features; supposedly, she has a French father and a Chinese mother. The appearance of Sara can be customized with different eye colors, skin tones, hair colors, and hair lengths. Lee aka Lily (OR-008 / Jinshan no. 35) is the fourth female head for OR Doll's 156 cm body OR156. The head is made of TPE and features "sleeping beauty" style closed eyes. Das Aussehen dieses Kopfes dann daher zwar nicht mit unterschiedlichen Augenfarben, aber mit verschiedenen Hauttönen, Haarfarben und Haarlängen variabel gestaltet werden können. Sasha aka Aimeel (OR-011 & OR-012 / Jinsan no. 37) is the fifth female head for 156 cm body OR156 by Oriental Rose. Sasha's looks might be customized with different eye colors, skin tones, hair colors, and hair lengths. Sherry (OR-013 & OR-014 / Jinshan no. 40) is the sixth female head for the 156 cm bodies OR156 by OR Doll. Ellie (OR-029 / Jinsan no. 42) is a female head by OR Doll. The head is made of TPE. Grace (OR-020 / Jinshan no. 75) is a female head by OR Doll. The head is made of TPE.